Hey there! Do you like the comedy of Groucho Marx? Do you like the music of Carmen Miranda? Do you like the sweet song stylings of Andy Russell? Do you like beautiful women with nice legs? You do? Well then, brother, have I got a picture for you. Alfred E. Green’s Copacabana is a classic example of a Hollywood product that is designed for only one purpose — to entertain. 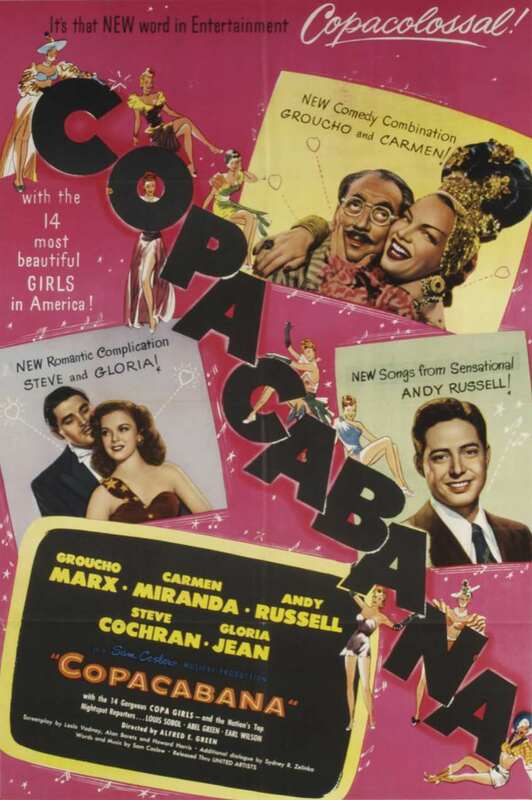 The plot of the film is little more than an excuse to showcase Groucho Marx’s wordplay and fast-paced comedic line deliveries, Carmen Miranda’s mesmerizing vocal performances, big musical numbers featuring the 14 beautiful “Copa” girls, and Andy Russell’s syrupy, sentimental songs. The plot, which can summarized on the back of a cocktail napkin, is this: wildly unsuccessful nightclub performer Lionel Q. Deveraux (Groucho Marx) and his fiancée of 10 years, equally unsuccessful nightclub singer Carmen Navarro (Carmen Miranda), decide that desperate measures are called for. Deveraux has been kicked out of more clubs than he can count, and threats like, “This is an outrage. You’ll hear from my lawyer, as soon as he gets a telephone,” clearly aren’t getting him anywhere. Meanwhile, the starry-eyed Anne Stuart (Gloria Jean) toils away in the office of the Copacabana as Steve Hunt’s gal Friday, unable to tell Steve how she really feels. Will she ever be able tell him? Will the wide-eyed, golly-gee naïveté of singer Andy Russell (played by singer Andy Russell) and his encouragement that she express herself through song help? Will that song be called “Stranger Things Have Happened”? You’ll just have to see Copacabana to find out. I’m not the biggest fan of musicals, but I’m perfectly willing to sit back and be entertained by one if it’s well put together, and Copacabana features plenty of entertainment bang for your buck. It’s especially entertaining if you’re as much of a sucker for great gams as I am. The Copa girls are blessed with pretty faces, good singing voices (although I’m not sure if they were actually singing during their numbers), dancing ability, and — most of all — shapely getaway sticks, which are on display even when they’re in the background. When Mlle. Fifi sings her first number at the Copa, “Je Vous Aime,” the Copa girls are draped all over the place like leggy cats, listening in rapture. 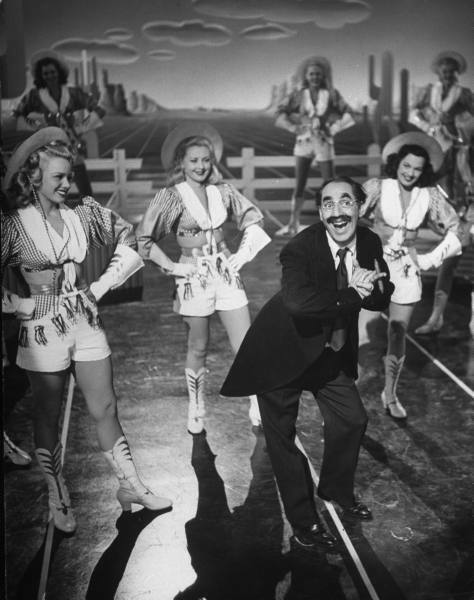 And speaking of perfect pins, I’d be remiss if I didn’t mention Gloria Jean’s final song and dance with Groucho Marx and Carmen Miranda, in which she wears a shorts and high heels outfit that might be the cutest thing I’ve seen in a movie from 1947 so far. Most of the music in Copacabana is written by Sam Coslow. It’s uniformly good, but for my money, the best song in the picture is Carmen Miranda’s performance of “Tico Tico No Fubá,” which was written by Zequinha de Abreu and Aloysio de Oliveira. Posted in 1947, May 1947 and tagged Alfred E. Green, Andy Russell, Beacon Productions, Carmen Miranda, Comedy, Copacabana, Gloria Jean, Groucho Marx, Musicals, Steve Cochran, United Artists. Bookmark the permalink.